Karen De Coster, CPA is a libertarian accounting/finance professional and freelance writer covering food freedom, regulatory abuses and free market economics. 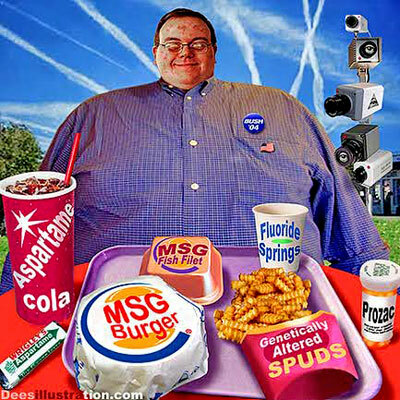 I’ve explored and written on food politics for years, using articles and direct links back to my sources to show evidence that the 'Big Agra-Big Food-Big Pharma-Big Government' complex is a pernicious corporatocracy with various satellites in place to conduct its dirty work of politicking, plundering, deceptive marketing, and purposefully mis-educating the masses. The American Dietetic Association recently changed its name to the Academy of Nutrition and Dietetics (AND). Michele Simon, president of Eat, Drink, Politics, a watchdog organization, has produced a useful 50-page report titled, And Now a Word from Our Sponsors - Are America’s Nutrition Professionals in the Pocket of Big Food? What is the role of the Academy of Nutrition and Dietetics (AND) - the nation’s largest association of nutrition professionals - in preventing or at least stemming the tide of diet-related health problems? What responsibility does this influential group of registered dietitians bear to be a leading advocate for policy changes to make eating healthfully more accessible? Does forming partnerships with the food industry compromise such a group’s credibility? And what does the food industry gain from such partnerships? Why does it matter? As this report will show, the food industry’s deep infiltration of the nation’s top nutrition organization raises serious questions not only about that profession’s credibility, but also about its policy positions. The report is another in a long chain of scathing indictments against the corrupt corporate state that has turned a mostly healthy populace into a sickly and obese society that has become disgustingly dependent on the pharmaceutical-psychiatric-medical machine that has long neglected unprofitable preventative care measures in favor of profitable standard medical protocols that address symptoms in the short term so as to make people patients for life. You’ll note that Simon, in her study, points to her friend Marion Nestle, a writer and author and long-time antagonist of Big Food, and a dissector of all things food politics unless it indicts government as one of the culprits. Make no mistake - both Simon and Nestle - are statists to the core. Neither of them have challenged how the Big Food corporate state became so omnipotent in the first place. The entire world of food politics in which they live, breathe, and swim is littered with the carcasses of government policy and dictocrat decrees. Still, they refuse to acknowledge the depth of the food politics for which they claim expertise, and they consistently maintain a position that their roles are to influence and change policy. Yes, policy = politics. They are self-declared politicians and they make a financial living off of politicking. On page 23 of the report, Simon describes how the annual AND meeting was akin to a junk food industry showcase. Then she goes on to say the “positive” aspects of the annual meeting were the folks hawking “Meatless Mondays” and the American Cancer Society. The American Cancer Society is another corrupt satellite of the government-pharmaceutical-medical establishment, and its mother ship, Big Cancer, is another quasi-governmental machine that profits immensely off of keeping people sick and uninformed. Apparently, while carefully studying the AND’s long list of Big Food and pharmaceutical sponsors, Simon neglects to mention the similar sponsors of the American Cancer Society. Near the end of the report (page 38), Simon backpedals and waxes poetically about personnel changes at the AND that are moving the organization along a path to change. She is setting the stage for the notion that the AND can revive its tarnished reputation (page 38). Statists like Simon are fond of revealing the evidence of gross misconduct and then ramping up an opposition cloaked in apparent principles, but always, they leave the door open for a future alliance and a potential consulting gig. This report has a lot of valid bark and recites much useful evidence, but there exists no bite whatsoever. Due to the prodigious influence of Big Food and its cornucopia of marketing lies, the entire Registered Dietician profession is made up of legions of hypnotized automatons who have been reciting the standard, politicized text for decades, while their helpless victims - uneducated, sick people - have paid the price in terms of their lives, whether it be quality or quantity. Don’t expect the self-declared soldiers of food politics, like Simon and Nestle, to strike at the root of the problems anytime soon.